Speak of the Shadow: Comeback of Rock Final. 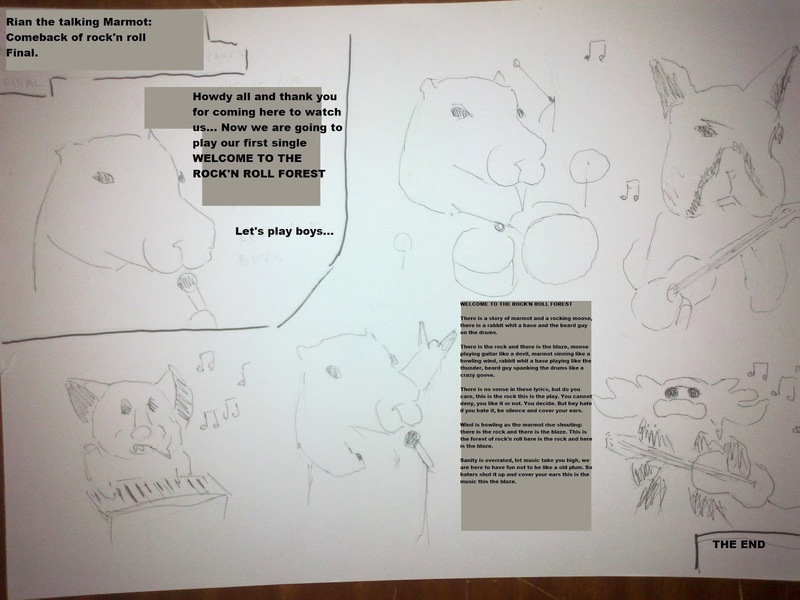 There is a story of marmot and a rocking moose, there is a rabbit whit a base and the beard guy on the drums. There is the rock and there is the blaze, moose playing guitar like a devil, marmot sinning like a howling wind, rabbit whit a base playing like the thunder, beard guy spanking the drums like a crazy goose. There is no sense in these lyrics, but do you care, this is the rock this is the play. You cannot deny, you like it or not. You decide. But hey if you hate it, be silence and cover your ears. Wind is howling as the marmot rise shouting: there is the rock and there is the blaze. This is the forest of rock'n roll here is the rock and here is the blaze. Sanity is overrated, let music take you high, we are here to have fun not to be like a old plum. So haters shut it up and cover your ears this is the music this the blaze.